Forklift Plug & Socket Electrical Connectors, Replacement Battery Chargers for Forklifts, Fork Lift Electrical Code Switches at Global Industrial. 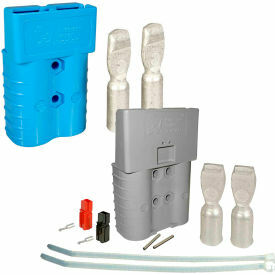 Forklift Plug and Socket Electrical Connectors provide Reliable Conductivity. Forklift Plug and Socket Electrical Connectors are made of impact resistant polycarbonate with silver plated, solid copper contacts for long lasting durability. All models have a self-cleaning contact designed to resist arcing. The contacts also have flared and heat treated barrels, which readily accept fine stranded wire to ensure a consistent contact. Available in 50, 120, 175 and 350 amps. Colors: Blue, Red, Yellow, Gray, Green, Orange and Black. SB, SBX and APP are registered trademarks of Anderson Power Products, Inc.
TVH Parts Forklift Electronic Code Systems help Restrict Use to Authorized Drivers Only. TVH Parts Forklift Electronic Code Systems keep unauthorized personnel from operating a forklift or similar dangerous industrial piece of equipment. 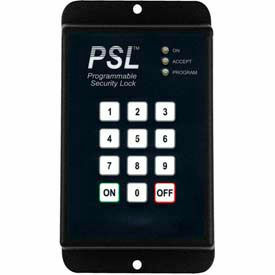 The Systems can track up to 99 programmable User Codes and has a Last User I.D. Function that allows a Supervisor to identify the most recent driver. The Maintenance Cycle, which ensures optimal use, runs for 250 user hours and beeps intermittently until it resets. Available with 12-120 or 12-90 volts. Meets UL, CE Certifications, RoHS compliant. 1 Year Warranty.